TASK: Facilitate assimilation of enemy vessels. Where present, allows yours transporters to beam through opponent's SHIELDS. 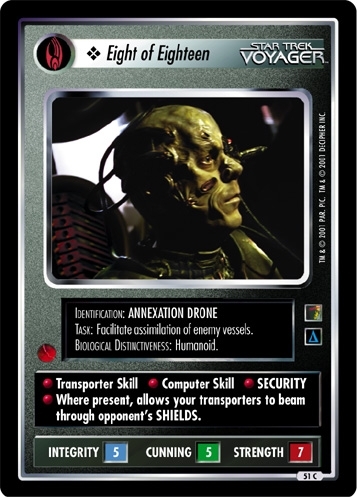 Characteristics: Beaming, affiliation, Drone, Borg species. There are 15 entries for Eight of Eighteen (ST1E 13 C 51) at the Tradeplace (57 haves and 0 wants). Click here to see all trade list entries for this Common card!